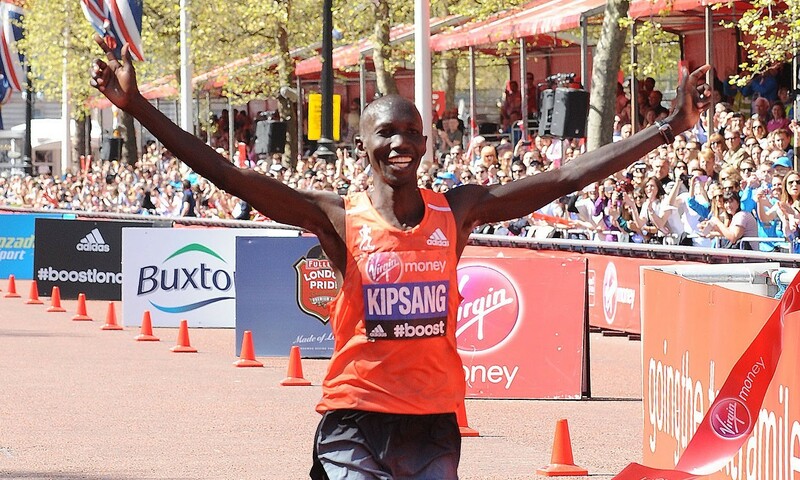 Wilson Kipsang beat arguably the strongest field in London Marathon history with a course record of 2:04:29 as Mo Farah struggled on his debut back in eighth place in 2:08:21. It was a baptism of fire for Farah as he failed to break Steve Jones’ British record of 2:07:13 and had to be content with beating Charlie Spedding’s English mark of 2:08:33 instead. Once again Kenya proved they are the masters of the marathon. Kipsang’s fellow countryman, Stanley Biwott, also cracked 2:05 as he finished 26 seconds behind in second, while there was a Kenyan one-two in the women’s race with Edna Kiplagat out-sprinting her namesake Florence Kiplagat on The Mall to win in 2:20:21. The top Ethiopians had to settle for third place on the podium in both elite races, with 2013 winner Tsegaye Kebede recovering from a recent bout of typhoid to clock 2:06:30 in the men’s race and Tirunesh Dibaba running 2:20:35 on her debut after losing ground at 30km after she dropped a bottle at a drinks station. Most attention focused on another debutant, though – the Olympic and world 5000m and 10,000m champion Farah. Initially, his plan to hold back off the world record pace of the leaders looked smart, but during the middle section of the race he found himself detached from pacemakers and running alone as he tried to claw back the one-minute deficit. Ultimately he began to fade in the final 10km and firstly drifted outside UK record pace and finally settled for eighth place just behind Tsegaye Mekonnen, Geoffrey and Emmanuel Mutai, who finished in fifth to seventh respectively. But will he return to the marathon after a debut that saw him not only finish almost four minutes behind the winner but also well over a minute adrift of a UK record which was set in 1985 by an athlete who earlier this week described himself as “a journeyman” compared to Farah? Others fared worse. Stephen Kiprotich, the Olympic and world champion from Uganda, was 12th. Ibrahim Jeilan, Farah’s Ethiopian nemesis on the track, dropped out after 35km after falling off the pace, while Haile Gebrselassie, the celebrity pacemaker, ducked out before the leaders hit halfway in 62:30. Chris Thompson, also on his debut, ran a solid 2:11:19 in 11th but Scott Overall struggled to match his 2:10:55 PB and gritted it out to finish in 2:19:55. In the women’s race, Tiki Gelana, the Olympic champion from Ethiopia, was dropped early on and finished ninth in 2:26:58, while Priscah Jeptoo, the 2013 London winner from Kenya, pulled up at 18 miles after being prominently positioned for much of the race. Elsewhere, the third, fourth and fifth British men home were Steve Way in 2:16:25, John Gilbert in 2:16:44 and Ben Livesey with 2:17:43. When it came to female domestic contenders, Amy Whitehead ran 2:34:20 and Emma Stepto clocked 2:36:05, while Scottish-based Irishwoman Nicola Duncan ran 2:33:28. The wheelchair race saw David Weir thwarted in his quest to win a record seventh title as he was outsprinted by Marcel Hug of Switzerland. Tatyana McFadden of the United States retained her women’s title after having recently won silver in the cross country skiiing at the Sochi Paralympics.